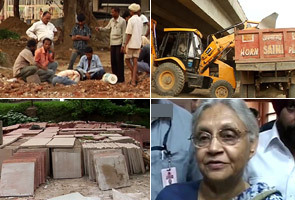 New Delhi: Delhi Chief Minister Sheila Dikshit had last Month set August 10 as the deadline for removing all Commonwealth Games related construction and demolition waste from the city and ordered all civic agencies to strictly comply with the time-frame. "I have said before that all most of the big malba will be cleared by August 10. Most of the work will be completely by 30-31st of August. We have kept the whole month of September to complete any other work," the Chief Minister had said on July 30. She had also reiterated that there would be no deviation in the deadline to halt digging work and to remove the malba. On Tuesday, when asked about missing the deadline, the Delhi Chief Minister said that most of the debris has been removed. "Debris has been removed to a very large extent so please give a real picture. But definitely, debris is still there. Whenever you build something, whether it is a house or a building or a road, debris is bound to be there, but it have been clearing it all up and we will clean it all up," she said. But with tonnes and tonnes of rubble still strewn around across the city, this does not seem possible. NDTV's camera crew has found mounds of debris in several localities like Siri Fort, where work has been going on since over a month. The scene is pretty much the same at Connaught Place too, where vehicles have to dodge around the debris. It's the same story around Shivaji Stadium as well. With unfinished construction and debris strewn everywhere, it is difficult to believe that the Games are less than two months away. When asked whether government will miss the deadline to remove the debris, Finance Minister A K Walia preferred not to comment. "I will not comment on the issue," he said. Dikshit had last month asked her cabinet colleagues not to air views about preparation for Commonwealth Games. Chief Secretary Rakesh Mehta, who was asked the same question, only said removal of debris will not be completed in areas where street-scaping works are going on. "We have already removed 80,000 metric tons of debris. More or less removal of construction waste will be completed by the deadline," he said. Mehta said removal of debris will not be completed in NDMC areas as DMRC has been allowed to carry out digging till August 15 for their works. The Commonwealth Games 2010 merchandise launch, which was scheduled for Monday has been postponed for the second time. With just 55 odd days to go before the Games, the delay in merchandise is likely to hit the revenue generation. The Games merchandise was supposed to be available from June onwards. And just as a point of comparison, merchandise for the 2012 London Olympics is already on the market, for the Beijing Olympics merchandise was sold from almost a year before the event.